It's about time I gave these bluetits names! I have always found this difficult and it was one of the many things that Elizabeth used to do for this web site. 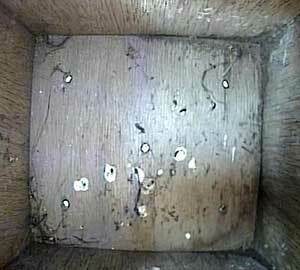 However, it is becoming increasingly convoluted to refer to "the female bird in Box1" so I'm going to call the pair in Box1 Ann and Andy, and in Box2 it's Bella and Ben! 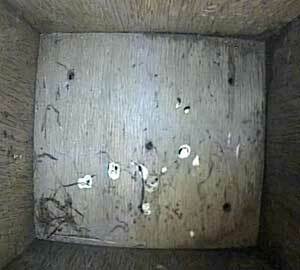 If any birds appear interested in Box3 they will be called Carla and Colin. Next year I shall use names starting with the letters D, E and F! I doubt if I shall get as far as X, Y and Z! This was the state of Box1 last night . . .
. . . and this was its state this morning. No change! Last night it looked pretty certain that a bird would be roosting - and if it did, it must have been Ann.